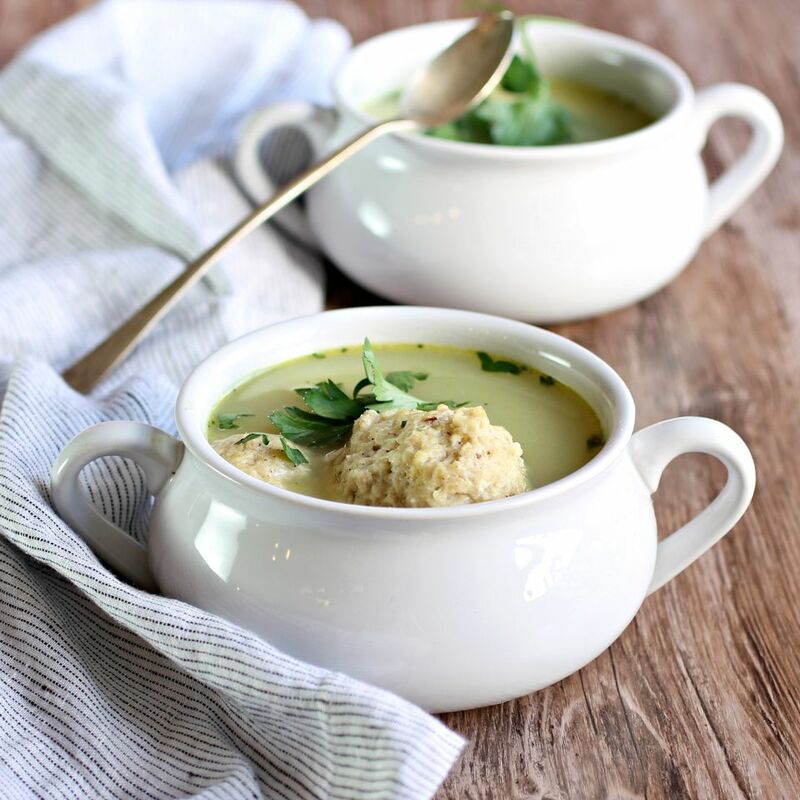 Although there a plethora of Passover recipes, we'd have to say that the quintessential Passover food is absolutely matzo ball soup. Because no flour is allowed at Passover, matzo meal is frequently substituted. Sometimes it's an acceptable substitution and sometimes it's a bit of a sacrifice but matzo balls are one case where it's not a matter of substitutions at all. They're simply dumplings made from matzo meal and they are amazingly good. Growing up in New York I saw plenty of matzo ball soup year-round because it's a staple of any good deli, along with corned beef and a hot pastrami on rye. Usually, the deli version of a matzo ball is huge (like the sandwiches) and quite soft. In contrast, my mother's homemade matzo balls were more flavorful but also a touch too firm. Of course, I grew up and absolutely had to learn to make them just right. To me, achieving the perfect texture requires three things - a smidgen of baking powder, a touch more water than the recipe on any matzo meal box gives and a longer refrigeration time. If you're concerned that the baking powder is a leavening agent (forbidden on Passover) I will say that it is a chemical, not a natural leavening and my research indicates that would be fine. But it's also a personal decision. More water adds moisture and a longer refrigeration time allows the mix to fully absorb the extra liquid. As for cooking, it's traditional to cook the matzo balls in your favorite chicken soup but I find they make the soup cloudy and prefer to cook them in water. As good as matzo balls are on their own, I've always looked for ways to add a bit more flavor with herbs or seasoning. My go-to has always been dill but the first time I added za'atar I was hooked on the little bump in flavor. However you make them, whether you're Jewish or not or whether you're celebrating Passover or not, I still urge you to go buy a box of matzo meal and make matzo balls because they are SO, SO good! ﻿In a medium bowl, whisk together the eggs and canola oil. Stir in the matzo meal, salt, za'atar and baking powder until well combined and then stir in the water. Note that the mixture will be very loose but will thicken as it stands. Refrigerate for at least 30 minutes. Bring a large pot of water to a boil. Scoop approximately 1 ounce ball of the matzo batter into the water. Cover, reduce the heat to low and let simmer for 30 minutes. Remove the cooked matzo balls with a slotted spoon or spider strainer and add to soup.